CRANDALL, REUBEN, Baptist clergyman; b. 24 March 1767 in Northeast Township, Dutchess County, N.Y., believed to be the son of Laban Crandall and Molly Seein; m. first c. 1786 Lida (Lydia) Mace, and they had seven children; m. secondly December 1813 Julia Smith, widow of Joseph Beemer, and they had two children; d. 28 Sept. 1853 near Aylmer, Upper Canada, and was buried east of Aylmer in the Burdick Cemetery. Ordination permitted Crandall to apply for the right to perform marriages in his district. That privilege had been restricted to clergy of the Church of England until a statute of 1798 extended it to clergy of certain other denominations. On 9 April 1805 the Court of Quarter Sessions, meeting in Haldimand Township, granted Crandall the authority to perform marriages in the Newcastle District. The following August he joined Joseph Winn and Abel Stevens* in ordaining another Baptist preacher, Elijah Bentley*. For the next seven years Crandall continued to serve the church in the central part of the province. In 1812 he relinquished his oversight of the Cramahe and Haldimand congregations and moved to the area west of Lake Ontario where he and his wife became members of the church at Boston in Townsend Township. While there, Crandall took frequent missionary tours through the newly opened districts along the Lake Erie shore. It was shortly after his move to Townsend that Crandall’s first wife died. His subsequent remarriage within a year was viewed as a scandalous act by the conservative members of his church. Crandall, however, refused to acknowledge that the church had any right to question him on the matter and the issue was quietly dropped. He then apparently settled for a brief time in Oakland; by 1816, however, he had made his permanent residence in Malahide Township near the present town of Aylmer. Here he led in the organization of a Baptist church which was established in October of that year with a charter membership of 12. Aylmer was to remain the focus of his future activities. In 1820 Crandall was arrested and tried at the spring assizes of the London District for illegally performing marriages. He had been granted permission to conduct such services in the Newcastle District, but that authorization was not valid in other areas. Following Crandall’s conviction Attorney General John Beverley Robinson* noted in a letter to the lieutenant governor’s secretary, Major George Hillier*, that Crandall had not only performed marriages without permission but, unlike the Methodist clergyman Henry Ryan*, had “solemnized matrimony in a manner that could not have been legal whatever his authority.” Robinson further stated that the judge was obliged by the statute to impose the full punishment – banishment for 14 years. Crandall, however, was contrite. According to Robinson he “urged” in his own defence that “Preacher tho’ he was, he could scarcely read and could not write,” and claimed that he had broken the law in ignorance. Given the situation and evidence of Crandall’s good character, Judge D’Arcy Boulton* decided to recommend clemency. 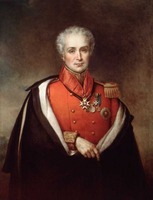 The decision was supported by the grand jury and a full pardon was ultimately granted by Lieutenant Governor Sir Peregrine Maitland. In the early 1820s Crandall gave up his pastorate at Aylmer but retained a permanent home in Malahide. He returned for a brief while to minister at Cramahe, and then moved to Southwold Township in the southwestern part of the province where he stayed approximately three years. By 1832 he was ministering to the church in Dumfries (North and South Dumfries) Township, and his address was given as Galt (Cambridge). He is also said to have worked in nearby Blenheim and Zorra (East and West Zorra) townships. Some time in the late 1830s Crandall retired to Malahide and there lived frugally until his death. Sources clearly show Crandall to have been a sincerely devout, humble yet determined minister of the Christian gospel. A notation in the minute-book of the Aylmer church dated 28 Sept. 1853 shows the loving respect in which he was held: “Elder Reuban Crandall, who has been a member of this church from its commencement, died to-day at the age of 86. Mark the perfect man and behold the upright, for the end of that man is peace.” By his life and work, Crandall is a superlative example of the evangelistic Protestant clergymen who did so much to develop church and community life in the rural environs of early Ontario. Canadian Baptist Arch., McMaster Divinity College (Hamilton, Ont. ), Aylmer Baptist Church (Aylmer, Ont. ), church minute-book, June 1848-January 1888; Biog. file, Reuben Crandall, especially certificate to Crandall, 9 April 1805. PAC, RG 5, A1: 24133–42. David Benedict, A general history of the Baptist denomination in America and other parts of the world (New York, 1848), 899. S. Read, “A memoir,” Christian Messenger (Brantford, [Ont. ]), 23 April 1857. Toronto Christian Observer, 3 (1853): 173. J. C. Crandall, Elder John Crandall of Rhode Island and his descendants (New Woodstock, N.Y., 1949), 105. Z. M. Hotson, Pioneer Baptist work in Oxford County ([Innerkip, Ont., 1939]), 26, 36. Stuart Ivison and Fred Rosser, The Baptists in Upper and Lower Canada before 1820 (Toronto, 1956). Rev. Dr. Davidson, “Rev. Reuben Crandell, Aylmer: the pioneer preacher,” Canadian Baptist (Toronto), 1 Feb. 1866. Douglas L. Flanders, “CRANDALL, REUBEN,” in Dictionary of Canadian Biography, vol. 8, University of Toronto/Université Laval, 2003–, accessed April 20, 2019, http://www.biographi.ca/en/bio/crandall_reuben_8E.html.